Western blot analysis of extracts from 293 and HeLa cells, untreated or TPA-treated (200 nM for 30 minutes) using Phospho-Smad2 (Ser245/250/255) Antibody (upper) or Smad2 Antibody (lower). 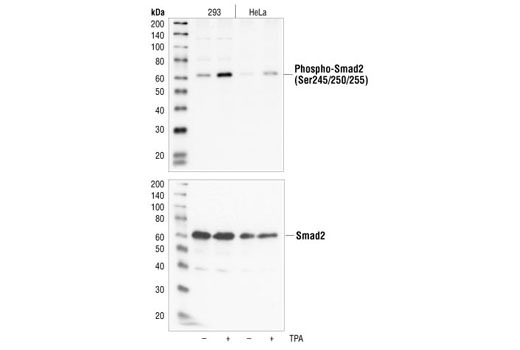 Phospho-Smad2 (Ser245/250/255) Antibody detects endogenous levels of Smad2 only when phosphorylated at serines 245, 250 or 255. Polyclonal antibodies are produced by immunizing animals with a synthetic phosphopeptide corresponding to residues surrounding serines 245/250/255 of Smad2. Antibodies are purified by protein A and peptide affinity chromatography. Oncogenic Ras antagonizes TGF-beta signaling and inhibits the nuclear accumulation of Smad2 and Smad3, which may be explained through MAP kinase dependent phosphorylation of these Smads (9).Cell stimulation with EGF leads to phosphorylation of Smad2 at a cluster of serine-proline sites within its linker region, including Ser245, 250, and 255 (9). Kretzschmar, M. et al. (1999) Genes Dev 13, 804-16.